This week on “The Historians” podcast, Wanda Burch discusses her book, The Home Voices Speak Louder than the Drums: Dreams and the Imagination in Civil War Letters and Memoirs. Singer-songwriter John Kenosian has set some of these letters and memoirs to music. Kenosian and Burch are performing a concert series in New York’s Montgomery County called Home Voices: The American Civil War Experience through Words and Music. The Town of Minden will hold its 3rd Annual History Fair on Saturday June 3rd from 10 am to 4 pm. 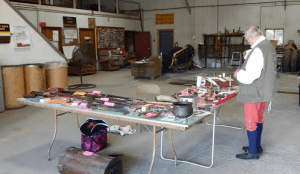 The event is a chance for local history enthusiasts to show their collections and exchange information on the history of Fort Plain, the Town of Minden and greater Montgomery County. This week on “The Historians” podcast, Tara Hime Norman discusses her book The Vindication of Lewis M. Roach (Dorrance, 2016) Norman makes the case that a Montgomery County trial convicted the wrong man in a sensational 1913 murder inside a rural farmhouse. This week on “The Historians” podcast Leader Herald newspaper columnist Peter Betz examines why a Montgomery County hamlet is called Tribes Hill.